Members of CAA have full access to our entire forms library. Become a Member Now! 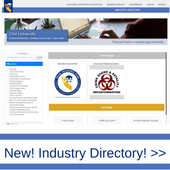 CAA provides members access to a complete library of over 180 California-specific forms that are recognized and recommended by the California State Bar and many regional courts. Forms are just one of the benefits of CAA membership. Learn more about how we can help you manage your properties, or spend 60 seconds and get a membership quote right now. 1. Fill out forms digitally: CAA’s Online Fill-Out Forms services allows you to easily populate bundles of CAA documents on the web by simply entering the data once. Interested in learning more about digitally filling out forms? Contact Members Services at (800) 967-4222. A benefit available for upgrade to any membership, is our Online Forms Service. Interested in upgrading your membership? 2. Incorporate into your customized tool: If you are using a forms tool at your company already (i.e. Yardi) we can provide you our forms electronically to be integrated into your platform. Just contact our office at (800) 967-4222 for more information. 3. Order padded forms and brochures: CAA offers preprinted forms that members can order. They are available here.